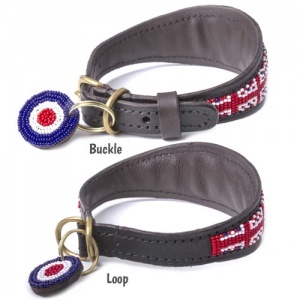 These collars are specially shaped for your sighthound. 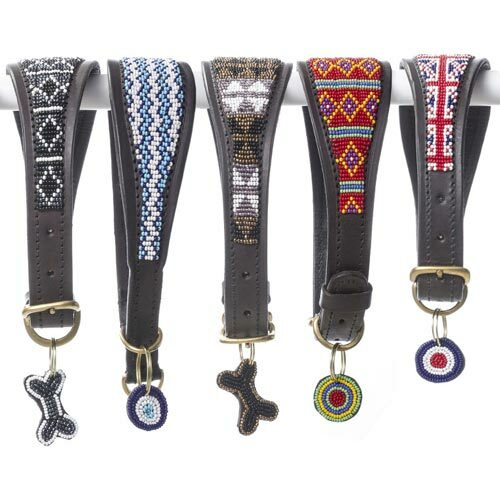 Breeds such as whippets, greyhounds and lurchers generally have much slimmer heads compared to their necks, meaning that they can usually back out of a standard shaped dog collar. 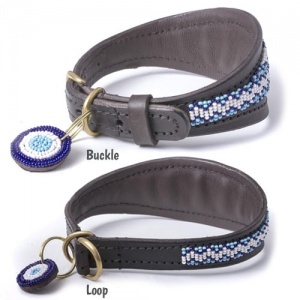 These collars are designed to prevent that happening. 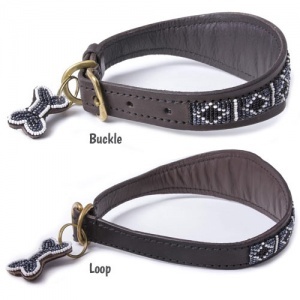 Also known as a fishtail collar due to their shape, they are wide and taper at the buckle end. 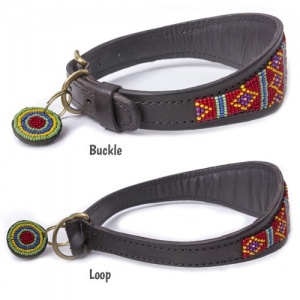 These hound collars are absolutely beautiful and each is ethically handmade in Kenya. 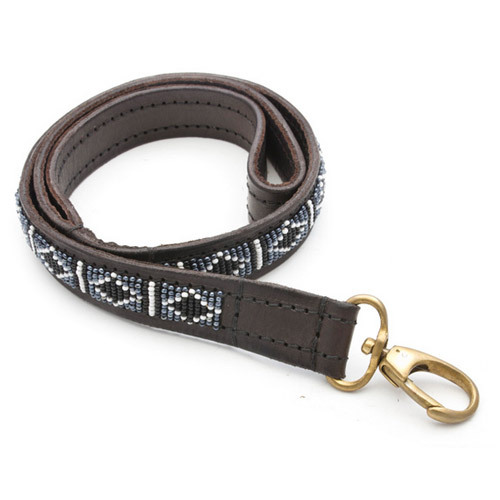 The soft free range Kenyan cowhide leather is hand beaded in a range of wonderful designs using 100% glass beads. 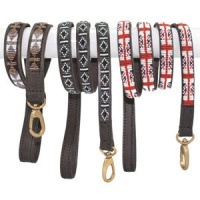 Each collar is then beautifully finished on the inside with a soft goat-skin lining. So soft and comfortable against your dog's neck. 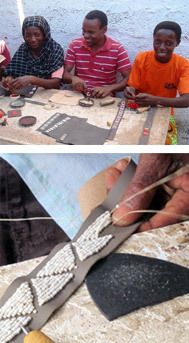 Unlike many cheaply made leather goods, the leather is not stained or sprayed. The saddlery grade dark brown leather is finished with high quality natural 'veg' tan that will not run. The furniture is a sturdy and reliable solid brass, hand cast by local artisans using melted down recycled brass. This benefits the environment and helps create employment too. These items are fair trade. As well as buying a beautifully handcrafted product, each purchase helps people in impoverished communities to support themselves. Workers are provided with fair working conditions and paid a fair price. The ethos behind is Think Trade, Not Aid! 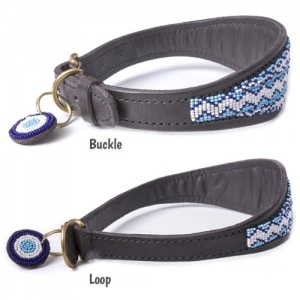 Your dog's new hound collar can be fastened with either a traditional fixed buckle or a loop (semi-slip). 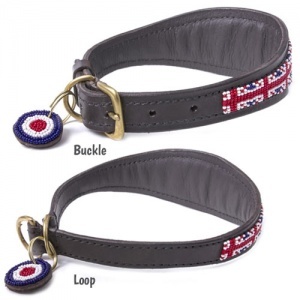 If your dog pulls on the lead we do not recommend the loop option. The loop means that the collar will be a loose fit when the lead is relaxed but will tighten to its smallest size when the lead is taut. Similarly, it should not be used to train or correct a dog. 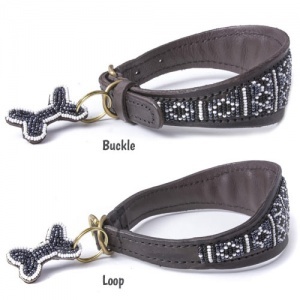 It is designed to stop your dog backing out of the collar whilst providing a relaxed fit the rest of the time. These whippet, lurcher, greyhound collars need to be a snugger fit (snug, not tight) than a standard dog collar and they usually sit higher up, so measure your dog's neck almost up behind the ears. 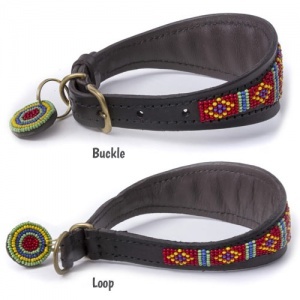 If you are buying the loop collar, the whole thing has to go over the dog's head so please take this into account. 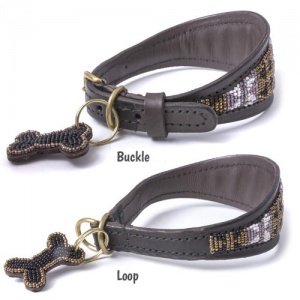 For this style you also need to check that the collar will be a relaxed fit when loose and that it will not tighten to a width that is less than the dog's neck circumference when taut. 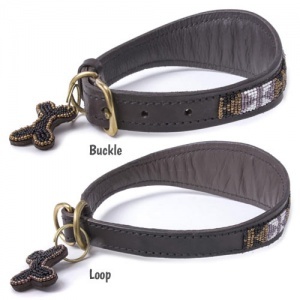 The idea is not to hurt or strangle but simply to tighten enough that the dog can't back out of the collar when taut. We cannot stress this enough. 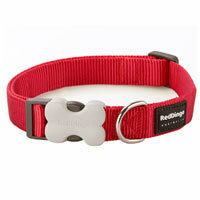 The smallest/tightest the Small collar will go is 11” and at its largest it is 14”. The smallest/tightest the Medium collar’ will go is 14” and at its largest is 17”.